AFFORDABLE SOLUTIONS FOR BETTER LIVING. STYLE, COMFORT and QUALITY. At Langfords Furniture in Stourbridge, West Midlands, we take pride in providing high quality, realistically priced, attractive, yet durable furniture. All products that are built and fitted are handmade at our factory in Stourbridge, and tailor made according to your wishes and specifications. 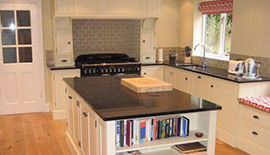 We are well known for our beautiful high quality bespoke fitted kitchens, bedrooms and alcoves. All of the materials we use are of the highest quality, and are carefully sourced from our reliable suppliers; we use solid timber such as: oak, cherry, tulip, pine and cedar we also use high quality accessories and various types of granite which are very popular for our kitchen orders. We hope that you enjoy looking through our website, and you see that all our bespoke, hand made furniture is unique and personally made for our customers and that you will find items to inspire you; either to duplicate or put your own personal twist on, it is entirely up to you! However, if you can't decide or aren't sure what it is you want exactly then rest assured our experienced furniture design team can help you with this, they will listen to your ideas and requirements and produce drawings/quotes to reflect these as it is important to us that our customers are happy with their products. Langfords Furniture is a small family run cabinet making business based in Stourbridge, West Midlands. It consists of a small team of skilled cabinet makers with years of experience and a small administration office. We have no sales team, therefore you will only ever reach one of the business owners or the Administration Manager giving you are more personalised service, which we believe makes all the difference. We have a small showroom attached to our factory that showcases some of our work, you are more than welcome to come along and take a look.